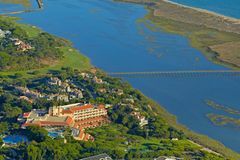 The Hotel Quinta do Lago is situated on the Algarve Coast, in the south of Portugal - a place of amazing natural beauty and where relaxing lifestyles are the norm. The Hotel has been a member of the “Leading Hotels of the World” since 1988, and is considered my most to be one of the best five-star luxury hotels in the Algarve. It is lies next to the Formosa Estuary (Ria Formosa) and the sea, in the very heart of the Ria Formosa Nature Park. Panoramic views are consistent throughout all of the rooms, suites, bar, restaurants, terraces and swimming pool – making Hotel Quinta do Lago a really special place to stay for your golf vacation. The Quinta do Lago Hotel is one of the best in the Algarve region of Portugal, and is certain to provide you with a memorable golf holiday in this popular Portuguese region. All rooms are furnished in a luxurious fashion and fitted to provide the guest with maximum comfort for a stay of relaxation and pleasure. The Suites and rooms contain an ultra-comfortable king-size bed or two single beds, flat-screen TV, minibar, safe and Wi-Fi access. All the en-suite bathrooms have warm towel racks, hairdryer, illuminating maquillage mirror a full range of complimentary toiletries as well as a bathrobe and slippers! There are two superb restaurants to dine in at the Hotel Quinta do Lago, each with its own distinct personality. Brisa do Mar is open for breakfast, lunch and dinner: serving a superb range of authentic Portuguese and International cuisine while providing stunning views over the Formosa Estuary and the beach. The Brisa do Mar can be enjoyed either al fresco style, from the special open-air terrace, or from the comfort of indoors. Cá d’ Oro Brisa, the second restaurant, is only open for dinner. It serves elegant Italian cuisine in stylish surroundings and some of the favourite dishes on the menu include the appetizing risottos and the “Traditional Taglierini Verde Cá d’ Oro” – one of the house specials which pleases the regular diners time after time. The Hotel is situated just a stone’s throw from the magnificent Quinta do Lago beach and during the warm months guests are given access to the private beach club which will offers towels, lounge chairs, beach umbrellas, water and fruit. The beach isn’t the only activity to keep you occupied when you’re not on the golf course; there is also comprehensive spa facility: containing 4 treatment rooms, a gymnasium, a heated indoor pool (counter-current and massage jets), a Turkish bath and a sauna. To top it all off there’s an outdoor Jacuzzi which has spectacular views across the Ria Formosa. Excellent room with garden and sea views. Service in all depts excellent.